The Most Fun-Filled Pool Store on the East End! 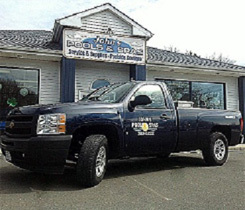 John's Pools & Spas has been proudly serving the Hamptons for over 30 years. Our goal is to provide the best customer service in the swimming pool industry. John's Pools & Spas is one of the very few swimming pool servicing companies in the Hamptons to earn Certified Service Professional status by the Association of Pool and Spa Professionals(APSP). We have 18 service and maintenance trucks on the road to offer our clients the fast customer service that they deserve. Few companies have a staff of service technicians available on Sundays all summer long. Our friendly office staff will answer every call with a smile during business hours. You shouldn't have to leave a message during the day and wait to see if it returned. Our staff attend industry trade shows and training throughout the year. We keep certificates on file. Management has weekly safety briefings and performs spot site inspections. John's Pools & Spas goes above and beyond what most swimming pool and spa service companies do to ensure our customers have a happy, healthy and safe swimming season. Get your pool ready for summer with a simple phone call. Our specially trained staff will remove and store your cover, hook up and test your pool equipment, clean your pool and adjust the chemistry. You just need to don your suit and jump in. If your swimming pool is outdoors, it is necessary to winterize your pool each fall to protect from damage caused by freezing. We will adjust the chemistry, clean debris from the pool, lower the water level, blow water out of the lines, disconnect pool equipment and put your cover on the pool. Hampton’s summers can be short, so you should enjoy every minute of it. Let one of our 20 service technicians clean your swimming pool. Every week your pool will be cleaned, skimmers emptied and water chemistry adjusted to meet ANSI/APSP standards. Our staff receives specialized training from industry manufacturers throughout the year; even in the off-season. We do this to keep up with the latest troubleshooting and repair techniques, so that we can offer you the most efficient and effective repairs. Certifications are on file at John’s Pools & Spas office in Westhampton Beach. For your health and safety, it is vital to begin the Hot Tub season with a clean tub, clean filter(s) and water that is properly balanced in accordance with ANSI/APSP standards. If you don’t visit the Hamptons in the winter, we recommend you winterize your Hot Tub in the fall. However, the fall and winter are great times to enjoy your Hot Tub. Our highly specialized service professionals will drain your tub, blow water from the lines and vacuum out any remaining water to prevent any damage due to freezing. We’ll put your tarp on to protect your cover from damage from debris and the elements. Organisms thrive in hot water. It is extremely important to keep your hot tub sanitized to prevent bacteria and algae growth. Your hot tub technician will clean the tub of debris, clean the filters and balance the water to ANSI/APSP standards. If your spa water is not properly balanced at all times, your water may have a bad odor, become cloudy, and cause skin irritations. It’s a good idea to test your water a few times each week. John’s Pools & Spas is the local sales and service company for Dimension One Spas and Nordic Hot Tubs. Our service professionals are trained to troubleshoot and repair any issues with these tubs. We carry parts for repair and warranty, so we can get your hot tub or spa up and running quickly. Revitalize your backyard with a vinyl liner replacement. It only takes a few days to turn that old pool into a new water playground. We will remove and discard the old liner, smooth the sand surface, add foam and replace liner and faceplates, restoring the look of your pool to its original beauty. Our heater technicians retrain yearly on many brands of propane and natural gas pool heaters. We are the local warranty center for several brands and keep many parts on hand to get your temperature up as quickly as possible. Plaster finished pools can stain and look dull. Often, we can restore the shine by acid washing the pool. When the plaster becomes rough to the touch(kids usually complain of scratching their feet), you will need to resurface the pool. When that time comes, we will recommend an industry professional who performs that work.